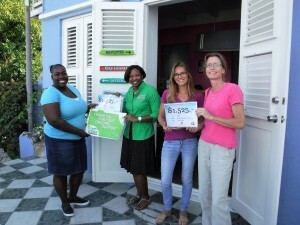 WILLEMSTAD - Boutique Hotel Scuba Lodge & Ocean Suites in Pietermaai donated more than $ 10,000 to CARF and GreenKidz in 2017. Since January last year, Scuba Lodge donates $ 1 per room per night to a good cause on behalf of its guests. Those staying at the boutique hotel are asked to make a choice between CARF and GreenKidz. Scuba Lodge has indicated that it will continue the Dollar-a-Night program in 2018 with the same two charities. Scuba Lodge consists of 28 hotel rooms and 11 apartments. Last year the hotel opened 6 new rooms after renovation of the building at Pietermaai 96.